제럴드 모리스 에덜먼(Gerald Maurice Edelman, 1929년 7월 1일 – 2014년 5월 17일)은 1972년 로드니 로버트 포터와 더불어 면역계에 대한 공로로 노벨 생리학·의학상을 받은 미국의 생물학자이다. 스크립스연구소 신경생물학과의 주임교수이자 신경과학연구소의 소장이다. 에델만의 노벨상 수상을 받은 연구는 항체 분자 구조의 발견과 관련되어 있다. 인터뷰에서 그는 면역계의 구성 요소가 개인의 삶에 따라 진화하는 방식이 일생에 뇌의 구성 요소가 진화하는 방식과 유사하다고 말했다. 에덜먼은 1929년 뉴욕 주에서 태어났다. 1950년 맥신 M. 모리슨과 결혼하였다. 뉴욕 시의 비주얼 아티스트 에릭, 신경과학자 데이비드, 이렇게 두 명의 아들이 있다. 딸 주디스 에델만은 음악가이다. 그는 생애 말에 전립선암과 파키슨병이 있었으며, 2014년 5월 17일 84세의 나이로 캘리포니아주 라호이아에서 사망하였다. ↑ “The Nobel Prize in Physiology or Medicine 1972”. 2007년 9월 27일에 확인함. ↑ Structural differences among antibodies of different specificities Archived 2006년 5월 8일 - 웨이백 머신 by G. M. Edelman, B. Benacerraf, Z. Ovary and M. D. Poulik in Proc Natl Acad Sci U S A (1961) volume 47, pages 1751-1758. ↑ 가 나 Rutishauser, Urs (2014). 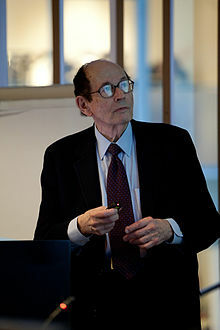 “Gerald Edelman (1929–2014) Biologist who won Nobel for solving antibody structure”. 《Nature》 510 (7506): 474. Bibcode:2014Natur.510..474R. doi:10.1038/510474a. ↑ “Gerald M. Edelman, Nobel Laureate and ‘Neural Darwinist,’ Dies at 84”. The New York Times.com. 2014년 5월 23일. 2014년 5월 23일에 확인함. ↑ “Gerald Edelman, Nobel laureate dies”. U-T San Diego.com. 2014년 5월 20일. 2014년 5월 21일에 확인함.